In Australia it is certainly true that the journey can be as important as the destination, especially in a land dominated by expansive outback landscapes and outrageously beautiful coastlines. Nothing beats the freedom or versatility road tripping can give. Exciting, memorable and once in a lifetime epic adventures are a definite in a drive Down Under and one you will be talking about for years to come. Regardless of whether you are young or old, solo traveller or family unit, wildlife spotter or desert lover when you are behind the wheel, inspired adventure is in your hands. Cruising these sun-kissed coastal routes or motoring through the bush and dramatic mountain passes, one thing for certain the temptation of the open road is irresistible! So kick the road trips into gear, hire a campervan or 4 wheel Drive, hit the road and to take the ultimate trip of a lifetime. To help you get started on your dream road trip this guide of the best Australian road trips will give you a taste of what is on offer. Highlights – too many to list! 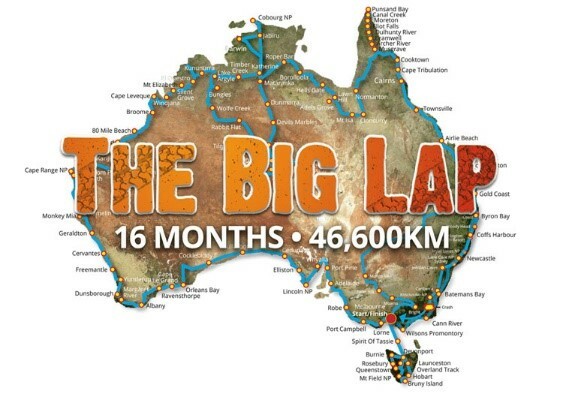 The Big Lap is a Road Trip around the perimeter of Australia. The journey is 46,600km and can take several months or more than a year even year. Many Australians dream of doing it when they retire or do a gap year as it is so much more than a holiday but a way of life. The trip visits all 8 State or Territories, – New South Wales, Queensland, Victoria, Australian Capital Territory, Northern Territory, South Australia, Western Australia, and Tasmania. This includes the South, East and West most points and some people include Cape York as the Northern tip of the country but this ‘Developmental Road’ is a dirt road and in wet season you can get stuck in the mud. Easy to get to off the Big Lap is the Westernmost point- ‘Steep Point’ and Eastern most point –‘Cape Byron’ and the highest point Mt Kosciuszko. The Southernmost tip (mainland) -Wilsons Promontory, is about 90km off the big lap. Experience the outback away from the crowds and be prepared to travel long stretches of up to 200km without seeing anyone. Although you do see 2WD backpacker type vans the driving is technically difficult. There are no towns out there so being prepared with water, food as you start off at Alice Springs. As you leave Alice Springs a day can be taken to enjoy and explore the sheltered gorges and peaceful waterholes of West MacDonnell Range National Park. Then at Standley Chasm watch the rugged rocks blaze in the sun and enjoy the contrast of light and shadows of the sun as it shines on the Ghost Gums contrasting the veins of quartz in the rock faces. Look out over the cliffs at the many gorges you cross then cool off in the swimming holes of Ellery Creek Big Hole and watch the sunset turn from purple to burnt orange/red on the rocks at Glen Helen Gorge. Head to Gosse Bluff or Tnorala, is a vast meteor crater 20km wide made when a comet crashed to earth around 142.5 million years ago. Then at Kings Canyon learn about the Luritja Aboriginal people who have lived there for more than 20,000 years after climbing the rim of the canyon to see the inspiring sandstone cliffs and rock domes of the Lost City! Afterwards take in the power of the second major attraction of Uluru-Kata Tjuta National Park, Kata Tjuta formally called ‘the Olgas’ and its steep russet domes on the Valley of the Winds walk. On returning to Alice Springs along the 445km journey stop at Henbury Meteorites Conservation Reserve to see 12 large craters in the arid surface of the desert, that were formed when a meteor hit the earth’s surface 4.7k years ago. Before arriving in Alice Springs, detour to see the multi coloured bands of in the free standing cliffs in Rainbow Valley in part of the James Range. Highlights – Millaa Millaa Falls, Undara Lava Tubes, Cobbold Gorge, Boodjamulla National Park,. 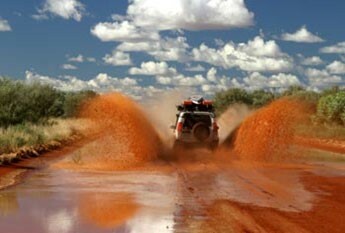 The Savannah Way is Australia’s Adventure Drive, and arguably most interesting drive route. It goes across the top part of Australia stretching from Cairns in Queensland to Broome in Western Australia. It can be tackled in short bursts Heading West from Cairns there is a drive up to Kuranda range and out to the Atherton Tablelands to Mareeba. As well as this being coffee country the fertile land means you pass through mango orchards, cane fields and macadamia plantations. Stop at Millstream Falls, one of the widest single-drop waterfalls in Australia. Near Ravenshoe dotting the landscape with windmills is Queensland’s largest wind farm. Undara National Park has world’s longest lava tube system, caves formed from flowing lava, and home to colonies of microbial communities. From Undura head to Mount Surprise where you can try your luck at fossicking – a recreational activity searching for gold, fossils and precious stones. Stop at Georgetown to see a large mineral collection then head to Cobbold Gorge with 20 metre high spectacular sandstone cliffs and deep gorges with permanent water holes. The overall length of the Gorge is approximately six kilometres, but a small boat can only go 500m through a watercourse. Formed through sedimentation 135 million years ago, the sandstone was subjected to large scale faulting and weathering by the elements as well as torrential wet seasons carving out deep gorges leaving permanent water holes. Forge on to Normanton, marking the end of the bitumen for another 700km, then to Karumba and Burketown stopping just south of the Savannah Way is Boodjamulla National Park featuring the idyllic Indari Falls. If you overnight in Burketown from September to November – early risers may be treated to spectacular rolling clouds travelling at up to 60km per hour and extend as far as the eye can see, appearing in the hours before dawn, a phenomenon called the ‘Morning Glory’. Normington to Katherine is about 1700 kilometres. Borroloola is on the way and is a remote city in the Northern Territory located on the coast of the Gulf of Carpentaria. It is one of the oldest cities, gazette in 1885. It is known for its dark past as a lawless frontier town. One of the must see spots in this region is the Carabinirini Conservation Reserve to see the sandstone structures called the Lost City. From Cape Crawford, the next stop along the Savannah Way road trip is called the Roper Bar Route section. The Limmen National Park and Lorella Springs are the two main destinations along the way. Fresh water fishing in the billabongs and rivers is excellent in this area. Your next stop on the drive is to take the Roper River Road to Mataranka, a stop to relax in the warm, pure and relaxing Mataranka Thermal Pools is a must. Nearby Katherine there is Nitmiluk National Park home to majestic Edith Falls and the Jatbula Trail. The road Katherine to Broome is a good sealed highway. Stop off at Kununurra is a hub and the attractions around Victoria River and Timber Creek are worth exploring. By the time you reach the historic pearling town Broome you will be ready to stroll along the pristine white sand and swim in the clear water of Cable beach as well as visiting picturesque Gantheaume Point – home of the 130 million year old Dinosaur footprints and the remains of Anastasia’s Pool. Travel – 3 -7days or more, as there is so much to see and do on this drive so give yourself plenty of time to give you an enticing taste of tropical road tripping. Route – 142km, both the inland and coastal routes are sealed, not gravel. Tropical North Queensland is known as a region of enchanting beauty. 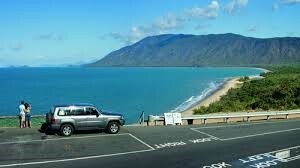 An essential road trip in Australia, the 140km strip of bitumen between Cairns and Cape Tribulation is known as the Great Barrier Reef Drive. The road winds between wet tropical rainforests and the Great Barrier Reef. On Going from Cairns to Mossman along Captain Cook Drive are the northern beaches. Set alongside sweeping stretches of beachfront parkland of Yorkeys Knob, Clifton Beach, Trinity Beach and Palm Cove are Cairns suburban coastal communities with restaurants, cafes and accommodation. The further north you drive you will have to get used to having the beach to yourself as there are long stretches of beach sand untainted by human footprint with views of forest-clad mountains starting to tumble into the sea. Port Douglas is worthy of at least a few days indulgence. A laid back beachfront village with a modern feeling, there’s restaurants, cafes, hotels, markets, boutiques and a plenty of things to do. It’s also a great spot to board a boat heading out to the Great Barrier Reef. Experience an introduction into Indigenous heritage and the Kuku Yalanji people at Mossman Gorge. Dreamtime walks, pristine rainforest, waterfalls and the crystal clear Mossman River are all enticing there. On the way passing Mossman, Daintree Road goes into Rainforest Road has canopies of trees overlooking some of the prettiest beaches on the planet. On the banks of the Daintree River you are likely to spot saltwater crocodiles sunning themselves on the riverbank. Brush up on geographical history by calling in the Daintree Discovery Centre. Then continue the tropical road tripping by checking out Thornton Beach, Coconut Beach and Noah Beach, are all worth a stroll for solitary beachcombing. So too the Dubuji. Marrdja, Kulki Boardwalks for easy forest walks. As the road winds its way to the remote headland of Cape Tribulation the world’s oldest rainforest collides with the legendary Great Barrier Reef. But beware, as between November – May, there are stinging jellyfish in the seas. If you want to swim in the ocean at this time you should wear a stinger suit and of course always be aware of swimming near mouths of rivers as crocodiles are found in the estuaries! 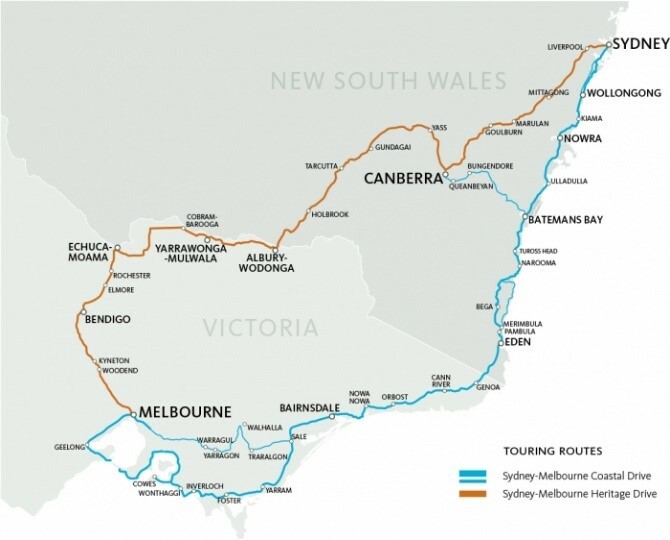 The Great Southern Touring Route offers some of the best of Australia’s beaches, coastline, countryside, forests, history and heritage. The route starts at the state’s capital, Melbourne, located in the South Eastern state of Victoria. This circular route can be taken in any direction. 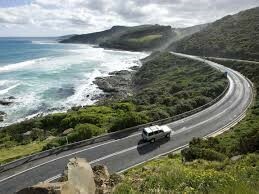 There is a good standard of coastal and inland roads which also allow for any tourist stop offs. Starting at Melbourne, once on the road and passing Torquay, you will officially start of the Great Ocean Road and will wind your way along magnificent coastal views and surf beaches. Famous for the ‘Koala walk’ at Kennet River, kangaroos can also be seen lounging among the trees. 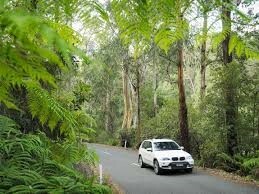 On passing Apollo Bay, the Great Ocean Road turns into the lush rainforest of Otway National Park. Between Otway National Park and Port Campbell are the famous 12 Apostles, a group of magnificent rock stacks rising up from the Southern Ocean. Then just past Port Campbell are the beautiful Bay of Islands to see off the coast. At Warrnambool you will find much of the maritime capital’s history with Logan’s beach giving visitors, who are there in the winter, awe inspiring glimpses of blue whales. On approaching Port Fairy you can turn off to Tower Hill State Game reserve (with its extinct volcano) where you must keep your eye out for emus, koalas and waterbirds who roam among the lake filled craters and hills. The half hour drive to Dunkeld brings you to the gateway of the Southern Grampians, where you enter a series of forests, rich with wildlife and rugged sandstone mountain ranges. Much of this is home to outstanding Aboriginal rock art sites. In the national park Halls Gap is a good base for exploring the mountain ranges, with your camera constantly poised for wildlife including wedge-tailed eagles and wildflowers. As well as Mount William, Wonderland Ranges and Victoria Valley, Mackenzie Falls is one of Victoria’s largest and most striking waterfalls. Along the Western Highway towards Ballarat you passing the impressive Mt Ghiran. At Ballarat, an imposing 19th-century goldfield town, you can discover the region’s gold mining history and visit the gold rush museum before heading back to Melbourne. The epic drive from the world’s most isolated city, Perth, to the stunning, pearling town of Broome in Western Australia’s Kimberly region is one of awesome Australian beauty. Head north along the Indian Ocean coast line and you will see a true desert landscape in Nambung National Park, where the weathered rock spires of the Pinnacles rise out of yellow sand dunes. Then pass the dramatic red gorges of the Kalbarri National Park. At Kalbarri visit the exotic tropical parrot habitat then drive up to Monkey Mia to meet the dolphins and see the stromatolites at Shell Beach. At the Shark Bay World heritage site discover the different sea life and land forms. Continue North to Carnarvon, a tropical fruit growing town and cross the Tropic of Capricorn. Arrive at the end of the Coral reef in Coral Bay and snorkel on the reef or swim with the whale sharks. At Dampier the stunning Dampier Archipelago has pools and astonishing views. At the gateway to the Pilbara coast and is Port Hedland which is one of the largest iron ore loading ports in the world and the largest in Australia. The rich cultural heritage and stories of local indigenous people can be discovered as well as the history of the mining industry. Before reaching there is a good deal of desert but in Broome you can cool off in the tropical waters of Cable Beach. But be warned on the road there are blowflies by day and extremely large mosquitos by night! This is one chilled road trip you won’t want to end. As you leave Sydney on the Princess Highway, turn left towards the coast down Farnell Avenue through the Royal National Park. Take a pit stop at the peaceful Port Hacking River and visit Bundeena Bay. The Grand Pacific Drive will have truly begun with panoramic view of the vast Pacific Ocean crashing against the Eastern coastline of Australia. Otford Lookout for gives more photo opportunity and you might spot gliders from the nearby Sydney Hang Gliding Centre. If you’re in an adventurous mood, you could try hang-gliding for yourself. A highlight for anyone on the Grand Pacific road trip is a drive across the scenic Sea Cliff Bridge. Next stop, Kiama a little village which is home to the famous ‘Kiama blow hole’, that shoots water high into the air It’s also the perfect place for pelican spotting and long walks along the stunning Seven Mile Beach. From here, follow the Grand Pacific Drive alongside the Shoalhaven River. Mosey around Berry, taking in the lovely antique shops and cafes. Next visit Jervis Bay, located within Booderee National Park, with its crystal clear waters and the whitest sand in the world, you could be forgiven for thinking you had been transported to a tropical paradise. Drive south to Batemans Bay, soaking in the coastal views along the journey. At Batemans Bay with lots of restaurants and pubs, check out the famous Clyde River Oysters. Then less than an hour down the Princes Highway you reach Narooma, home of the ancient rock formations, Australia Rock and the Glasshouse Rocks. A half-day tour of Montague Island, located just 8kms offshore and home of New South Wales’ only known colony of Australian fur seals, in addition to many kinds of seabirds and thousands of little penguins. The small village of Tilba Tilb is a great place to visit to experience what Australian life was like around the 1890’s and is recognised for the fact that it has retained its gold-rush era charm. Continue along the Sapphire Coast to Mimosa Rocks National Park with its tempting pure lagoons. At this point, you will cross state borders from NSW to Victoria. Next is Mallacoota which is close to Croajingolong National Park, a World Biosphere Reserves. From here go to Cape Conrany, then follow the South Gippsland Highway and head towards the small town of Yarram, Taking in beautiful scenery Hiawatha Falls located just out of town. At Wilsons Promontory, on the way through to Phillip Island check out the Shell Museum which hosts the first Australian dinosaur bones discovered in 1903. Then to Penguin Parade at the Phillip Island Nature Park to see the little penguins parade up and down the beach at dusk before heading back to Melbourne. Highlights – Barossa Valley, Flinders Range, Whyalla, Port Lincoln, Eyre Peninsula, The Nullarbor. Just an hour out of Adelaide is the Barossa Valley a most famous wine-producing regions is home to Australia’s most expensive wine. The Whispering Wall in Williamstown in the Barossa Valley is a unique phenomenon allowing you to “throw” your voice over 100 metre as the voice is carried from one side of the arch to the other. On the tip of the Spencer Gulf, Port Augusta is known as the “Crossroads of Australia” and the “Gateway to the Outback”. It is where you enter the northern and central region of the ruggedly beautiful Flinders Range, which is a range of mountains stretching 400km in length. The main features of this area is the magnificent Wilpena Pound, the Brachina and Bunyeroo and Parachilna Gorges, teaming with wildlife including emus, wallaroos and red kangaroos, as well as with endemic flora and fauna adapted to the semi-arid environment. Continue your journey south to the seaside town of Whyalla, famous for its annual migration in May- August of Giant Australian Cuttlefish. Stop at the seaside towns of Port Neil and Tumby Bay on your journey to Port Lincoln, the “Seafood Capital of the Australia” and is a seafood lovers’ dream destination. Travel next along the pristine Spencer Gulf and into the uniquely powerful and isolated Eyre Peninsula. Feel the wide open space of Australia’s vast Outback beneath your wheels on one of the world’s greatest adventure drives, across the vast, treeless, semi-arid Nullarbor where you will come across camels and the odd dingo. Cross the border into Western Australia and a different time zone! 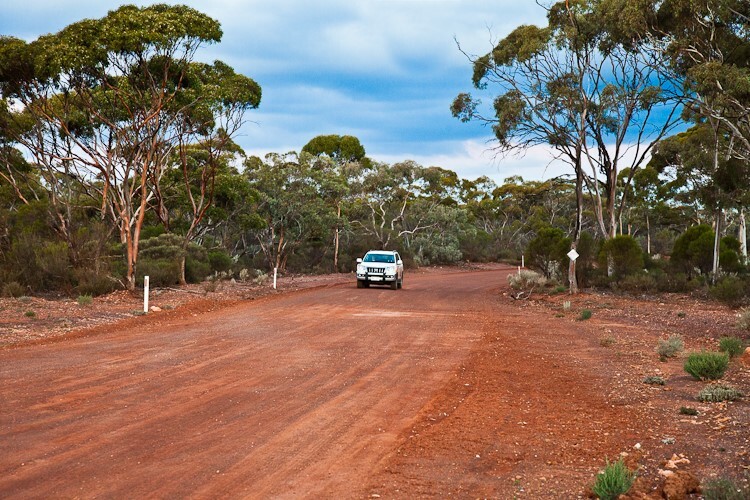 Then keep your concentration along the Nullarbor Plain from Calguna to Norseman as you go along Ninety Mile Straight, at 147km it’s one of the world’s longest stretches of straight road. Then drive through salt lake country to the goldrush town of Coolgardie. Then drive along the Southern Cross Highway through the Boorabbin National Park and into the wheatbelt and Merredin, before the homerun to Perth. This route is one of the most frequently asked about road trips in Australia, and makes up some of the infamous East Coast, and features some of the absolute must-sees of pristine islands in Australia like Fraser Island and the Whitsundays. Head North out of the city to Moreton Island which is mostly National Park with fabulous isolated beaches, large sand dunes, crystal clear freshwater lakes, mangroves and countless marine life. Continue on for about an hour to the Glasshouse Mountains National Park which has seven stunning mountains amidst 13 of the volcanic peaks which rise up dramatically from the landscape of eucalypts and pineapple plantations. Head on indulging in the 100km of beautiful beaches and pass through the laid back beachside town of Caloundra then on to the surfing and golfing mecca of Coolum. Mooloolaba is worth visiting just so you can say the name! And is one of the most picturesque on the Sunshine Coast with is clean white sands and azure waters. On to the hilly village of Eumundi with its mixes of historic Queensland village atmosphere and modern vibrant arts community. Once in Noosa much of the life takes place around the stunning sunny Noosa Main Beach, one of the only North facing beaches on the East coast of Australia. The trendy high street is full of bars and boutiques. Explore the chunk of wild coastline at Noosa Heads and Noosa National Park. Head on North along the Bruce Highway to Hervey Bay, the gateway to the famous Fraser Island with its stunning beaches, 100 freshwater lakes, crystal clear waters, rain forests and the odd dingo! Next stop Bundaberg is the home of a famous Bundaberg Rum distillery. Then on to the relaxed seaside town of Yeppoon nestled between two National Parks and the gateway to the Southern Great Barrier Reef. Visit Lady Elliot Island and Lady Musgrave Island, renowned for great diving and snorkelling. 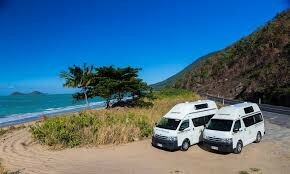 The last leg is the longest journey to Airlie Beach will take you about 6 hours via Gladstone and Rockhampton. The little iconic town of Airlie Beach overlooks the famous Whitsunday Islands and is a great place to base yourself for exploring the islands and Great Barrier Reef. This trip offers three very different and beautiful regions all just an hour apart. An hour’s drive from Melbourne is Yarra Valley where some of Australia’s finest wines are made. Hot air balloon rides can be tried too, as they set off at dawn and watch the sunrise over the Yarra Valley. Just a half hour on from the Yarra Valley are the towering forests and realms of secret fern glades of the Dandenong Ranges. Travel back in time aboard the historic Puffing Billy Steam Train to and from Gembrook. Visit the hauntingly astonishing Willliams Rickets Sanctuary which has 100 kiln fired clay sculptures of native animals and Aboriginal figures, set among ferns, rocks and towering Mountain Ash trees. Head then on to the unspoilt wildlife wonderland of Phillip Island. Abundant with creature’s great and small, bushland and quiet sandy beaches, you can get close to the largest colony fur seals in the country, cuddly koalas and greet migratory mutton-birds in wetlands teeming with life. Phillip Island is home to over 26 thousand little penguins that swim 100m out to sea each day. The Little Penguin Parade is world famous and the sight of the smallest penguins in the world emerging from the water and waddling to their burrows as the sun sets can be seen at Phillip Island’s Little Penguin Parade. Leaving Phillip Island, whilst travelling to Mornington Peninsula you will go through the eastern side of Port Phillip Bay with vast ocean views, seaside villages and beaches with colourful bathing boxes. Follow the rolling hills of the hinterland to Red Hill to find passionate winemakers famed for making the regional pinot grigio pinot gris, pinot noir and cool climate chardonnay. A half hour on the Mornington Peninsula has the galleries, spas and cafes pretty seaside villages, beautiful coastlines, top golf courses, and opportunities to swim with dolphins as well as chance to sample the regions wines.